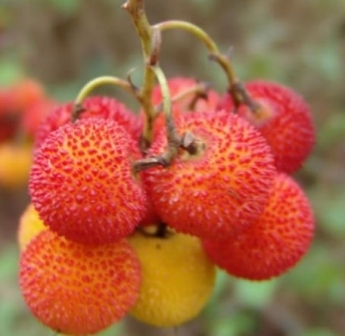 Interestingly, despite its name, the strawberry tree does not produce strawberries. Flowers hermaphrodite, white (rarely pink), born in drooping panicles of 10-30, bell shaped, 4-6 mm wide, The flowers have a soft honey scent. Fruit a red aggregate drupe, 1–2 cm wide, diameter, with a rough surface, maturing in 12 months at the same time as the next flowering., fruits are very showy. The fruit is edible, though many people find it bland and mealy. It has somewhat gritty skin, but the fruit itself has the texture of a lush tropical fruit and has a delicate pleasant flavour. For those people with sensitive taste buds, this is a fruit that can be enjoyed when eaten in moderate quantities. The fruit is eaten both raw and cooked but is insipid. The fruit contains about 20% sugars and can be used to make delicious and nourishing jams and preserves. It ripens in November/December. The fully ripe fruits fall from the tree. So it is advisable to grow the plant in short grass in order to cushion the fall of the fruit. The leaves, bark and root are astringent and diuretic. They are also a renal antiseptic and so are of use in the treatment of affections of the urinary system such as cystitis and urethritis. Their astringent action makes them of use in the treatment of diarrhoea and dysentery. A gargle can be made for treating sore and irritated throats. The leaves are gathered in the summer and dried for use later. The flowers are weakly diaphoretic. Tannin is obtained from the leaves, bark and fruit. The bark contains 45% tannin. Wood is suitable for turning and making Greek flutes. The wood also makes a good charcoal. Strawberry tree is an excellent choice for a shrub border or woodland garden, or even as a small specimen tree. 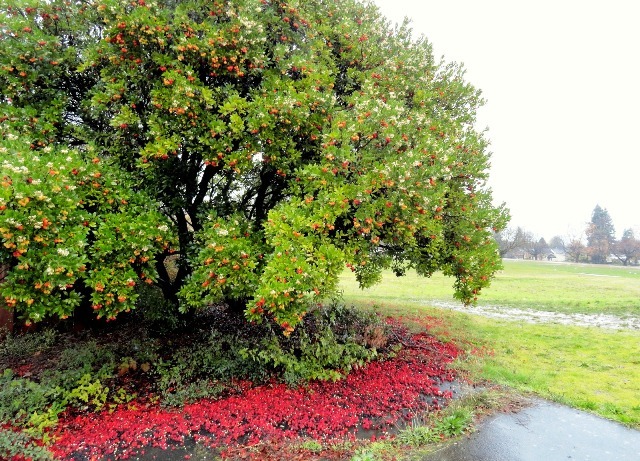 As this tree blooms and fruits in autumn, so a strawberry tree makes an unusual specimen shrub, showing pretty red fruits and little pinkish flowers through its shiny greenery when most shrubs are going dormant. Older specimens are especially attractive with their shredding gray-brown bark and twisted, gnarled trunks. Compacta – A dwarf cultivar reported not to flower very freely. Croomei – A dwarf-growing cultivar which is a reliable bearer. Elfin King – The fruits are up to 25mm in diameter and have a sweet flavor. A slow-growing compact plant, often no more than 1 metre tall. It comes into bearing early, sets fruit freely and is ideal for container growing. 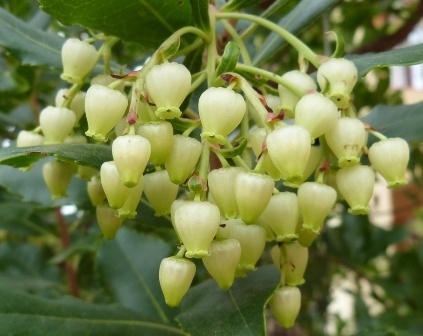 Strawberry tree can be propagated by seed, cuttings and layering. The layering, however, may take 12 to 18 months.